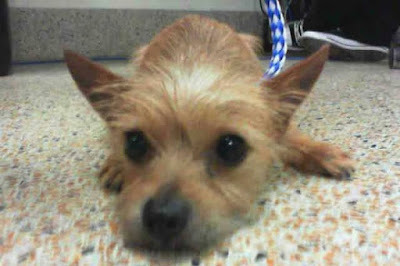 Nothing and no one could prepare you for the emotional roller coaster that is a visit to the Miami-Dade Animal Services. On the one hand, you get the sense that all of the dogs and cats trapped in the facility, will make it out fine and that each one of them will have a happy ending. The other, misery, knowing that some of the faces staring back at you, will be around the next time you visit., the majority of dogs and cat’s trapped at Miami-Dade Animal Services will never see the light of day. Most are giving just a few weeks and sometimes even just days to find forever families before the unthinkable happens: euthanasia. That’s because the majority of dogs and cat’s trapped at Miami-Dade Animal Services will never see the light of day. Most are giving just a few weeks and sometimes even just days to find forever families before the unthinkable happens: euthanasia. For one dog named Charlie, Miami-Dade Animal Services is his new reality. his owner didn’t want to “deal with his anymore” as one MDS staff member put it. And so one day, he rounded up the 1-year-old Yorkshire Terrier mix and mercilessly dumped his at MDS, knowing full well the ramifications such a decision could have. Charlie is fearful and terrified by the noise chaos and confusion that life at Miami-Dade Animal Services brings. Thankfully, he has us. Speak Up! if you or someone you know is interested in giving this precious pup the forever family he rightfully deserves, please contact the Miami-Dade Animal Services at (305) 8841101 or 311, and reference the shelter ID #(A1880391). Additionally, please share this story on Facebook or Twitter, so we are closer to finding Charlie the home he deserves. We have done it before and can certainly do it again.